In our employee profile series, we highlight Astellas’ commitment to Diversity & Inclusion by exploring the personal stories of employees. 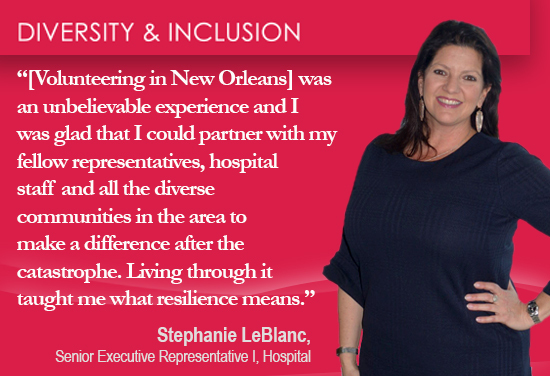 In our third installment, we speak with Senior Executive Representative I, Hospital, Stephanie LeBlanc. Can you tell us a little about your job at Astellas? I am a senior executive representative for the Hospital franchise in Lafayette, Louisiana. I’ve lived here most of my life and love the area, culture and people. I’ve been with Astellas for ten years now and really enjoy daily interaction with healthcare staff, doctors, and nurses. I look at myself as an educator. I help educate healthcare providers on our products so they can make informed decisions about treatment options for their patients. Does your job have personal meaning to you? It does. I work in cardiology and on a personal level, I lost a brother to heart disease and a father to a stroke. It makes my work with Lexiscan in the cardiovascular market that much more important and personally meaningful. Tell us about an experience that changed you. I was living in New Orleans when the levies broke and everything flooded during Hurricane Katrina - I managed to get to safety, but patients who depended on a regular supply of medication were in serious need after the storm. One of the hospitals I visited regularly was the only one that was operational in the area and they were performing open-heart surgeries, brain trauma operations, you name it - all just on generator power. I spent weeks helping there and visiting other local hospitals to bring whatever aid I could - including getting medication to cardiologists caring for patients with high blood pressure. It was an unbelievable experience and I was glad that I could partner with my fellow representatives, hospital staff and all the diverse communities in the area to make a difference after the catastrophe. Living through it taught me what resilience means. You’ve served as chair for the Astellas Stellar Women Employee Resource Group for several years – what motivated you to volunteer? When I joined Astellas, I was ready for a challenge and found myself in a situation where my colleagues were involved in numerous projects and I was not - I went to my manager who not only encouraged me to raise my hand but promised his support if I did. My colleagues, who know how much I value our culture of diversity and inclusion, suggested a leadership role with Stellar Women. One thing led to another and here I am. I learned that you have to create your own destiny. While I’ve given a lot of my time volunteering with Stellar Women, the support and encouragement I’ve gotten in return has been absolutely worth it. Six years ago, I made the decision to become a foster parent. As rewarding as it is, at times it can also be very challenging. The friends I’ve made in the Stellar Women ERG have been a huge support for me - in both my personal life as a mother and in my professional life at Astellas.